Having an external hard drive with a backup is good. But just making that copy isn’t enough. What happens if a disaster or a thief strikes your house? If your backup copy is near your computer, you’re out both your computer and your backup. 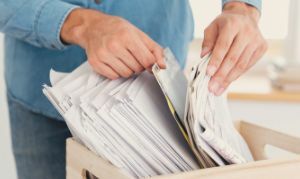 You need to have a backup separate — as in physically away from — your computer. It could be an external hard drive that you keep at a friend or family member’s house. It could also be in the cloud. But Amy, I don’t trust the cloud! Those businesses could go out of business! There’s an archival principle called LOCKSS - Lots of Copies Keep Stuff Safe. The more copies you have in various places, the greater the chance that you’ll always have access to at least one of them. Have multiple backups in multiple places to help ensure the longevity of your files. "I’m just going to keep everything on paper. Paper is safe. Paper is permanent." I actually had someone tell me that they were keeping everything only on paper "because paper is permanent." 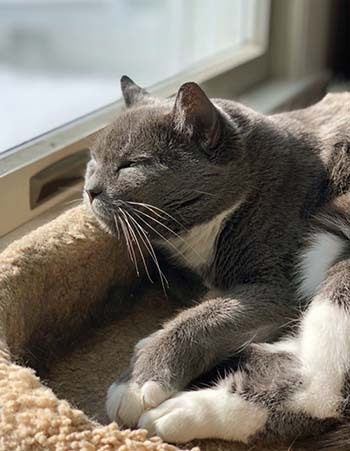 Don't let this sweet face fool you. She will tear through paper like a top-of-the-line shredder. Just because you have paper doesn't mean you don't need a back up. Lots of copies keep stuff safe. What About After You’re Gone? Most of us want our genealogy research out outlive us. The LOCKSS principle still applies. Get your genealogy in as many formats as possible in as many places as possible. At RootsTech 2018, I did a session with Curt Witcher titled “How NOT to Leave Your Genealogy Behind.” We shared some horror stories of people thinking that their research was going to last, including some with grocery bags and a drive-by donation. You can still watch that video on the RootsTech website. Part of getting your genealogy research to outlive you has to involve organization. If your genealogy looks like a hot mess, chances are high that your descendants are going to toss it out, either because they don’t care or because it’s in such a mess that they don’t realize what it is. 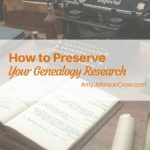 If you want to pick up some tips on organization, check out the interview I did with professional organizer and genealogist Janine Adams where she shared some practical and do-able strategies for organizing your genealogy research. Publishing your genealogy gets it into the hands of others. Publishing doesn’t have to be a book. It could be an article in the newsletter of your genealogy society or even the contributions you make to their collection of ancestor charts and family group sheets. What about applying to a lineage society? Most keep on file the application and the supporting documentation. It’s a way of preserving at least part of your research. 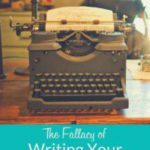 Blogging is also a form of publishing. Yes, publishing online has its own set of challenges related to permanence, but it is something. There’s also the informal publishing, such as sending emails to cousins and other family members. Even having an online family tree is an informal way of publishing. The key to preservation is to have as many copies as possible in as many places as possible. You’ve worked hard on your genealogy. Don’t leave its protection and preservation to chance. This entry was posted in Podcast, Preservation by Amy Johnson Crow. Bookmark the permalink. This is the first time I have listened to your podcast and I found it very helpful. 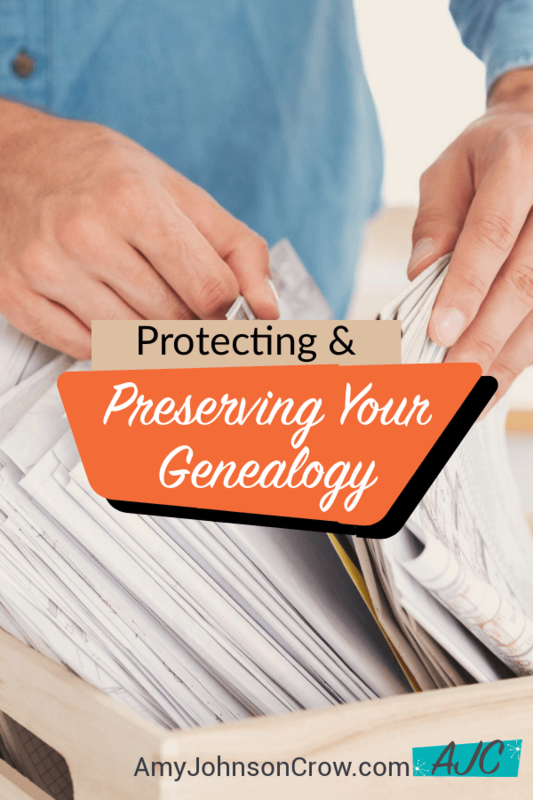 You brought up some good ideas for many ways to preserve genealogy. Thank you! Thank you for listening and for the kind words! I’m glad you enjoyed it! Great podcast!! Many good thoughts. Great article. Now I am off to watch your rootstech presentation. Thank you. Sure found this article helpful. Thanks!